After spending four days being with Delta Hands for Hope in Shaw, Mississippi, I asked the eleven students from Northminster Baptist Church, in Jackson, Mississippi, what they had learned or observed about Shaw in our brief time there. These were their immediate responses. The four days that preceded this conversation had been spent engaging with children and adolescents who had entrusted their care to Delta Hands for Hope (DHH). The students from Northminster had talked about tornadoes – constructing water tornadoes in two-liter plastic bottles duct-taped together, molding tornadoes out of Play-Doh, and coloring pictures of tornadoes while discussing how to seek safe cover should a tornado descend upon Shaw. 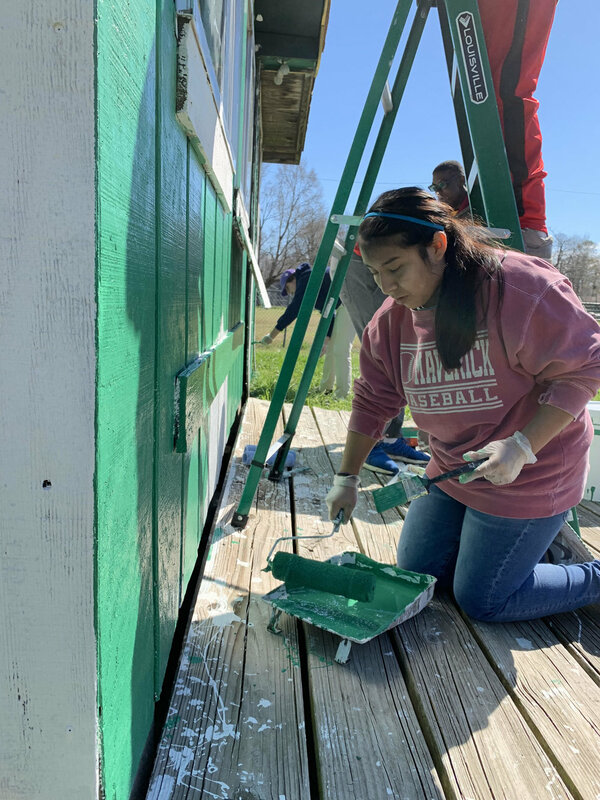 They spent a lot of time painting – a concession stand and ticket booth at the local high school football field, fire hydrants all over the community, newly installed doors at DHH’s facility. They built tomato trellises for community gardens. Importantly, all of these activities were done alongside residents of Shaw. Teenagers from Jackson and teenagers from Shaw working together on projects identified by stakeholders in the Shaw community. There were plenty of opportunities for play, as well. Every step of the way, where time and opportunity permitted, the two groups of teenagers were together – working, eating, playing – together. After four short days, when asked what the students from Northminster had learned about Shaw, the three above responses came. Incredibly, and likely accidentally, these teenagers stumbled on two exceptionally common traits of impoverished communities around the world and one that distinguishes a community as having not always been impoverished. Before accompanying this group to Shaw, I had spent the greater part of the last decade living and working in Southeast Asia with Mennonite Central Committee (MCC). My life and work with MCC was limited to communities in two countries. In these places, I encountered thriving communities of people living with less tangible wealth and property than many people in the United States – even in the Mississippi Delta – would think possible. Communities where electricity was inconsistent in availability and strength, communities where water was only available in public spaces to be carried to private spaces, communities where a “Boil Water” notice would be laughable because water always had to be boiled, communities where houses had only one room and no doors. By any monetary or development index consideration, these communities would be considered impoverished. Stories I heard from colleagues living and working in impoverished communities in all corners of the globe, similar to what the students observed in Shaw, supported the observation that there was “not a lot to do.” There were no movie theaters. No cellular network would support streaming high definition digital content or gaming. Stores, restaurants, and other businesses were few. There was not a lot of time for entertainment, but when people were able to make time for recreation, they entered into it the way they did most other activities: In community. They would play soccer, tell stories, or go to worship. Somehow, in each of these spaces, despite their lack of material wealth and that there was “not a lot to do,” people exhibited notable welcome and kindness – something that the students observed in Shaw, noting that “the people are so nice and friendly.” One of the best examples I can remember from Asia occurred in a small mountainside farming village. A friend was visiting my wife and me over the Eid-ul-Fitr holiday (the biggest religious holiday of the year in Indonesia). We decided to take a morning public bus from our home up to this little village so that we could hike a relatively short mountain (though tall by Mississippi standards). Having made this trek many times, I knew the route from the bus stop to the mountain (and back). I also knew that, while we were likely to find a motorcycle taxi to take us to the mountain on this special holiday, we would almost certainly have to walk the two miles (or so) back from the mountain to the main road, where we might (hopefully) catch a bus home. What we did not predict was the rain waiting for us on the mountain. When we descended, thoroughly soaked, we started our trek back to the main road that would take us home. We walked through a village that was devoid of signs of wealth. To our surprise, a van pulled up beside us. The family (easily outnumbering the seats available) motioned for us to get into the van. We protested that we were wet with rain and sweat, and they were all wearing their finest clothes, in celebration of the holiday. They insisted. They took us directly to the bus stop, offered us water and snacks, and refused to take any compensation for transporting us. There are so many parts of that story that seem unimaginable in the suburbs of the United States. Yet, when I imagine the many other impoverished communities I have visited (inside the US and outside), it seems very possible, if not likely. The first observation by students from Northminster about Shaw, that “a lot of buildings were not being used for what they were made to be used for” stands far afield from what I observed in impoverished communities in rural SE Asia. In these communities, the people had always been subsistence farmers. There had never been enough commerce to merit building anything beyond what was immediately necessary and useful. In Shaw, and in other towns like it scattered throughout the Mississippi Delta, there are many buildings that have long been abandoned, sometimes repurposed like the one that is home to DHH, more often (it seems) left vacant until they eventually collapse. These buildings are evidence of a thriving economy that once was – a time when these buildings had a purpose and when there was enough economic activity to support their use. Together for Hope is a coalition of development practitioners organized under the direction of the Cooperative Baptist Fellowship. Together for Hope started with a twenty-year commitment to the twenty poorest counties in the US. Bolivar County, home to Shaw, in Mississippi is among these twenty counties. Importantly, Together for Hope subscribes to development methodologies rooted in Asset Based Community Development, which has as a core belief that the development of a community should begin with identifying what assets, or strengths, the community already possesses (rather than starting with deficiencies). Utilizing this methodology, DHH and the community in Shaw were able to repurpose a building that was no longer being used for the purpose for which it was constructed. The building that houses Delta Hands for Hope formerly housed a grocery store, a club, and a retail store. This space now has new occupants with a fresh purpose: DHH operates a computer lab, library, community activity space, and food service space. They make available to the community a safe after-school and school break space for elementary-aged children. When children come to DHH, they are provided with a meal and meaningful interaction with volunteers who are interested and invested in their positive development. DHH also hosts a pharmacy technician class and opportunities for adults to complete a high school diploma equivalency. They are active agents in the community, seeking out ongoing activities, making concerted efforts to avoid redundancy in provision of goods or services, while also looking to make connections between existing assets and opportunities. Delta Hands for Hope invites groups to join in what is already happening in Shaw. When I first called and talked to Executive Director, Lane Riley, about the prospect of Northminster being with DHH for Spring Break, I asked what she hopes for most, from groups that come. Her response was telling of the kind of relationship-focused work in which DHH is engaged. “Repeat visits,” she responded succinctly. I am already looking forward to our next visit and what I might learn from my new friends in Shaw.